Home > Books > WHO SHOT PRESIDENT? Full-color & black-and-white photos. "A straightforward account of the killing and the continuing speculation about its circumstances. 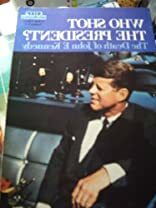 Beginning with the events of Nov. 22, the following chapters cover Kennedy's career, the arrest and murder of Oswald, the funeral, and the Warren Commission. Large print, short sentences and many photos make this attractively-designed volume suitable for older poor readers as well as for the primary audience." --Bulletin, Center for Children's Books.